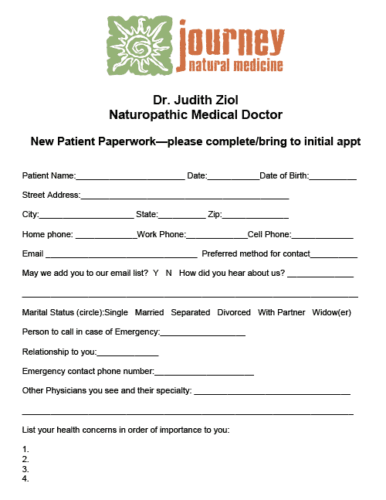 Please complete this form, and bring it with you to your first appointment. Dr. Ziol is not contracted with any insurance companies. She has reasonable rates. Some insurance companies do have an “out of network” benefit that may cover Naturopathic Medicine. Dr. Ziol’s office will, upon request, provide a coded service summary so you can submit a claim for reimbursement to your insurance company. Due at time of service. Dr. Ziol prefers cash or check, and for convenience accepts Visa or Master Card. Most Health Savings cards may also be used for payment. Dr. Ziol can order lab tests through Lab Corp or Sonora Quest (plus others) and for patient convenience, can draw blood in the office. Lab testing through the commonly used labs is typically covered by your insurance, however it is your responsibility to check with your insurance company and make sure tests will be covered, as every insurance policy is different. Naturopathic medical services are not covered by Medicare, Tricare or AHCCCS at this time. Service animals, disability, insurance claims, etc.